Before we start, here’s one video you want to watch. Trust me on this. Just gotten word that the sentencing of Hasti Fakhrai-Bayrooti in the drugged driving death of cyclist Eric Billings has been delayed due to a technicality. Fakhrai-Bayrooti unexpectedly pled guilty to a single felony count of vehicular manslaughter while intoxicated last March, and was scheduled to be sentenced to up to four years in prison today. The judge delayed sentencing until June 10th to allow the defense time to review the probation report. However, he revoked bail and remanded her into custody to be evaluated prior to sentencing. According to the OC DA’s office, Fakhrai-Bayrooti had Xanax and Suboxone in her system when she ran down Billings’ bike from behind on March 15, 2013, as he rode in a marked bike lane on Santa Margarita Parkway in Mission Viejo. According to My News LA, Billing’s daughter, who was six month’s pregnant when he was killed, gave birth to a son who will never know his grandfather. And one her brothers is getting married Saturday without a father to stand by his side. Mark Billings said he too had struggled with addiction, but it was his brother’s unconditional love that helped him overcome his own drug problems. Eric Billings “was the kind of guy who carried extra shirts and sweaters in his car to give to someone out in the cold,” Mark Billings said. I’m told the judge wept openly in the courtroom listening to the impact statements from family members. And the court reporter recorded it all with mascara running down her face. Once again, there’s bad news from Ballona Creek. A rider writing on Reddit reports that he saw another cyclist being robbed by four men on the bike path near the National/Jefferson exit Tuesday evening. This has been an ongoing, if infrequent, problem over the years; in fact, crime alerts on the pathway date back to at least 1990. It’s not that the bike path is particularly dangerous. However, just like any other place in the city where you’re out of public view, you have to be alert to the circumstances around you. If you don’t feel comfortable, wait for other riders to catch up, or go back to the previous exit and ride around the problem area. Just don’t hold your breath for the police to respond. There’s been an ongoing debate over which police agencies have jurisdiction where on the path. And riders have complained that 911 operators can’t seem to find it on a map to send anyone, anyway. CiclaValley offers a preview of the next week’s Amgen Tour of California, which starts on Sunday. The Sacramento Bee explains seven things you’ll want to know about the Tour of California; eight actually, since an update mentions that Marcel Kittel has pulled out. American Tyler Farrar is one of the riders to watch. And tour officials are working to keep the routes safe for the riders, unlike several recent racing calamities that left riders badly injured. Meanwhile, the women in these photos finally get four days in the AToC, which started Friday. Second-year UnitedHealthcare pro Katy Hall dreams of charging up Mt. Baldy just like the men, while Alison Tetrick looks forward to joining a deep field charging through the snow. While this year’s women’s tour is a big step forward, it’s long past time to let women racers compete on equal terms. And put them on TV, for chrissake. A sign on LA garbage trucks urges homeowners not to turn bike lanes into garbage lanes. I’m told the LAPD has gotten several complaints about people blocking bike lanes with their garbage cans. And yes, that is illegal. A new Toronto app allows riders to report cars blocking bike lanes. Maybe we need an LA version that lets us report trash cans, too. South La Brea is making a comeback. And a local bike shop is helping lead the way. 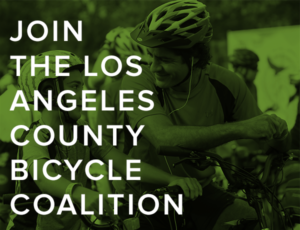 USC’s Story Space interviews the LACBC’s Eric Bruins and Michael McDonald of Bike the Vote LA; thanks to Streetsblog LA for the link. The Westwood Village Farmers’ Market is giving away a “sleek” new commuter bike from Helen’s Cycles to celebrate the new bike corral on Broxton Ave. Which would be the perfect place to park your bike to attend the Westwood Village Farmers’ Market. I’m just saying. Santa Clarita hosts the free nine-mile family friendly Hit the Trail bike ride on Saturday. 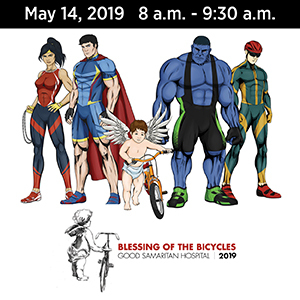 Former Olympic cyclist Tony Cruz will lead Saturday’s Tour of Long Beach, with rides from 30 to 100 miles, benefitting pediatric cancer research. Speaking of Long Beach, bike ridership is up 21% in the downtown area from 2013, suggesting that the city’s emphasis on building bike lanes is working. 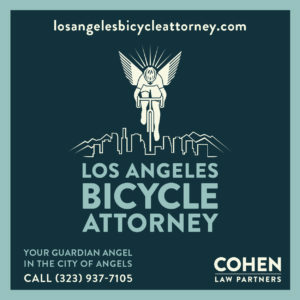 Women are invited to tell their story explaining why you need a new bike, and possibly win one from Pedal Love and Made in Long Beach. Red Kite Prayer remembers Bay Area bicycling legend Jobst Brandt, who passed away at age 80 after a long illness. San Bernardino deputies recover a Loma Linda boy’s $1,500 stolen bike after his father discovered it for sale on Craigslist. Bakersfield police release surveillance video of burglars who knocked off a local bike shop last month. Great idea for a bike ride, as the San Jose Public Library host the Gira de Libro, visiting five of the city’s 23 libraries. Rumor has it that LA has public libraries, as well, though few residents have actually been inside one. After the local Marin paper refused to even consider the possibility a bike rider might not have been at fault in a collision with an 80-year old woman, it turns out the rider did what he could to avoid hitting her. An estimated 15 to 17 mph sounds way too fast for a narrow bridge shared with pedestrians, though; we need to slow down when passing people on foot, just like drivers should slow down when passing bikes. A Sacramento bike rider was killed in a collision with a train. By far the easiest type of wreck to avoid, since trains have to travel on tracks and have warning lights, bells and/or crossing gates to tell you they’re coming. 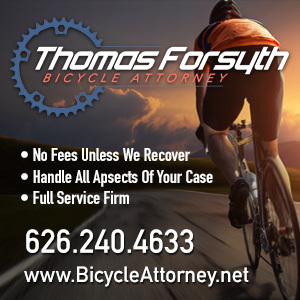 A Mariposa cyclist suffered major injuries when he was left crossed by a motorist; according to the comments, the victim is the principle double bass player for the local orchestra. Let’s hope makes a fast and full recovery. Performance Bicycle is named a Gold Level Bicycle Friendly Business. Then again, if a bike shop isn’t bike friendly, something is seriously wrong. America’s biggest bike share operator has now gone into the manufacturing business. As we’ve said before, people don’t ride on the sidewalk if they feel safe on the streets, as shown by a new protected bike lane in Honolulu that’s cut sidewalk riding by 65%. Salt Lake will build the nation’s first protected intersection, designed to keep bike riders and pedestrians safe. A texting teenage Chicago driver could get off the hook for hitting a cyclist because the police never read the driver her rights. Turns out Chicago’s favorite sport of the late 1800’s wasn’t hockey or baseball. So when, if ever, is that long-rumored Major Taylor movie coming out, anyway? Once again, a bike rider is collateral damage in a wreck between two drivers, this time in Milwaukee; the victim was an ice cream vendor on a three-wheeled bike. Kids, don’t try this at home. An off-duty New Hampshire cop was killed riding his bike down a flight of stairs — inside a house. The pope attends a singletrack bike fest. Oh, not that pope. A new study from the University of Duh says bike commuters really do lose weight, as long as they ride 30 minutes each way. Expect serious bike lust at this weekend’s Spin London bike show. A UK court is told a cyclist killed in an unsafe pass by his own father’s truck would have survived if he had only been wearing a helmet. Which is impossible to say with any certainty, despite the investigator’s apparent certainty. Sweden’s Princess Estelle looks like any other adorable three-year old bike rider with her pink helmet and training wheels. A new German safety campaign encourages cyclists to wear helmets, just like Darth Vader. Do they seriously think equating a bike helmet with crossing over to the Dark Side will actually work? As bicycling grows in Egypt, it’s even becoming safer for women to ride alone. Bangkok cyclists call for stiffer penalties for drunk drivers in the wake of two collisions in which drivers plowed into group rides, killing four people; police promise to step up safety measures. How many times do we have to say it? If you’re riding your bike with an outstanding felony warrant, stay off the damn sidewalk in Santa Monica, already. Now you too, can have a truly tasteless bike taillight dangling from your seat, just like the big boys in their trucks; the sad thing is, it was actually funded. And Bremerton WA police have apparently developed a new technique to stop fleeing drivers by throwing out a bike strip; no word on whether they use roadies, fixies or mountain bikes. I ride on the Balona Creek path from time to time over the years. Definitely some shady peeps hang out there. I would avoid the night, weekend days are going to be fine bc there are a lot of extra cyclists. These paths are not patrolled and the cover from bushes and fences encourages illicit activity. Just ride at your quickest pace, like you know where you are going, don’t stop if someone yells at you to stop, ride with conviction. I have been known to carry a lightweight flat travel body alarm for riding in areas that are shady anywhere. I clip it onto my bib. When activated it lets out a LOUD constant squeal. Practice activating it while riding and you will be ready. That will scare most away. Similar problems on the path that goes from Huntington Beach to Yorba Linda in the OC. The part that passes through Santa Ana is loaded with creatures and the SA police will not crack down. The SG River Trail and Coyote Creek tributary both have similar problems with shady characters up to no good. Police worthless and unavailable, witnesses few and far between, hobos living in the bushes. Being a bike rider should qualify one for a concealed carry permit to ensure safety on the streets and trails. The Homeless are a crime and safety issue. They provide cover for individuals up to no good. The police can’t easily distinguish between the two. In some cities, homelessness is treated as a public safety issue and people are not allowed to camp or conjugate on the riverbeds or streets. Newport Beach, Irvine, Huntington Beach crack down. But in some more liberal cities, like Santa Ana, Los Angeles, Santa Monica, they do not. Complicating the issue in Los Angeles County is that the LA County Sheriff has contracts with the County to patrol certain areas and mass transit. They get paid big $$. LA PD takes the position that unless they are getting paid to patrol a certain area–they are not responding–call the Sheriff they will tell you. Many incidents over the years in LA on Mass Transit, where criminals know that LAPD will not respond because the Sheriff has the contract for security. They wait until the bus is in LAPD territory, commit the crime, because Sheriff does not have units stationed too close and LAPD will not respond. Major mess past few years with these divided contracts.